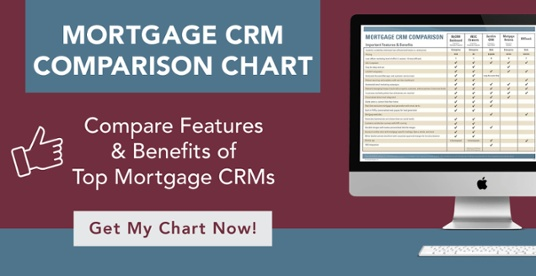 If you hope to thrive in today’s mortgage industry, it’s absolutely essential that your mortgage CRM includes features that make your business more competitive by improving lead generation, capitalizing on client referrals, and focusing on client retention. Leverage key marketing assets that support your lead generation activity. In other words, it’s a multi-faceted process that generates leads and increases sales with the goal of helping your business grow. A mortgage CRM is an invaluable tool for attracting more leads and nurturing customers. Pipeline Management: Use CRM application data to qualify leads who are ready to buy while keeping those who are “just looking” in the pipeline. You can also see what stage sales deals are at in the pipeline so no opportunities are lost. Customer Analytics: Leverage your data to increase sales by analyzing which leads are producing the most sales and revenue, and determine which marketing strategies are most successful. Nurture Relationships: An effective mortgage CRM solution is focused on building customer relationships and finding better ways to engage customers. The detailed data collected and the reports generated help you provide better customer service, anticipate customer needs, and build strong customer profiles. Marketing Integration: Integrating your marketing with a mortgage CRM will reduce lost leads and help you stay on top of sales opportunities. You can generate high quality leads by sending out customized email marketing, orchestrating marketing campaigns, broadcasting marketing collateral to targeted lists, and more. The benefits of generating leads with a mortgage CRM include a shorter sales cycle, more accurate data, and improved efficiency through the elimination of manual tasks. There’s simply no better solution for capturing pertinent information and turning prospects into customers.